SMITHFIELD, RI — Herbold Meckesheim SB Series Granulators employ a screw-feed mechanism, which makes them quieter and more efficient than gravity-fed size-reduction equipment for pulverizing Polyethylene Terephthalate (PET) bottles and other recyclable plastics. Suitable for dry or wet operation, an SB Series Granulator is capable of processing up to seven tons of plastic per hour. Materials to be granulated are delivered from the unit’s hopper to the cutting chamber by one or more conveyor screws mounted at an angle (45° to 90°) to the rotor axis. The screws maintain a steady feeding pace, even if the plastic is a hodgepodge of sizes and shapes, instead of depending on the materials to fall directly into the blades. Throughput is 30% to 50% above that of gravity-fed machines with cutting chambers of the same size. Other benefits include less power consumption, quieter operation, no fly-back, reduced wear to the cutting blades, and reduced fines and dust (since granulated particles spend less time in the cutting chamber). 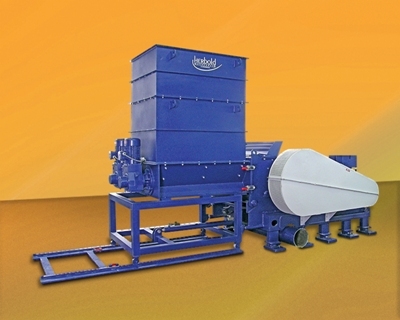 SB Series Granulators can also be used for secondary size reduction of pre-shredded plastics.